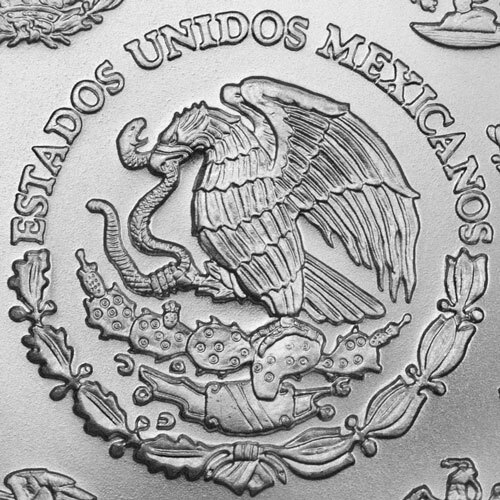 The Silver Mexican Libertad coin series is the most diverse silver bullion program in the world. Available on an annual basis since 1982, the Silver Libertad has twice grown in size with the addition of four fractional-weight coins in 1991 and two large-weight coins in 1996. 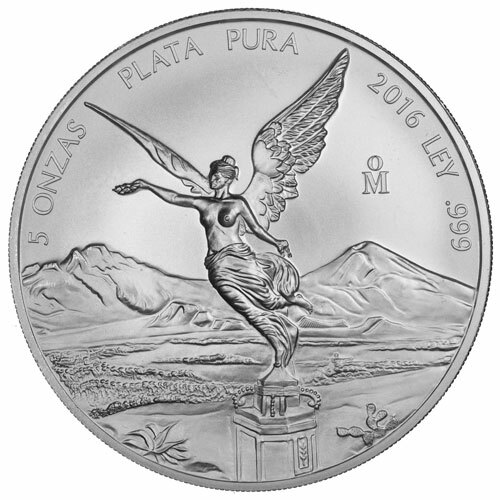 Right now, the 2016 5 oz Silver Mexican Libertad Coin is available as a BU specimen on Silver.com. 20th release of the 5 oz Silver Mexican Libertad coin! Individual coins ship in protective plastic, lots of 5 ship in mint tubes, lots of 100 ship in mint bags. Available as a Brilliant Uncirculated coin. Obverse features the image of Winged Victory. Reverse bears the coat of arms for Mexico. All Silver Libertad coins feature designs inspired by the gold Centenario coin. The image of Winged Liberty that featured on the gold Centenario has been refined and modernized for the Silver Mexican Libertad coins. Centenario gold coins had a face value of 50 pesos and were introduced in 1921 in celebration of the nation’s centennial independence festivities. Brilliant Uncirculated coins are available with no signs of wear and tear on the surfaces. However. you might notice minor detracting flaws such as breaks in the luster, spotted surfaces, or contact marks from the coining process. 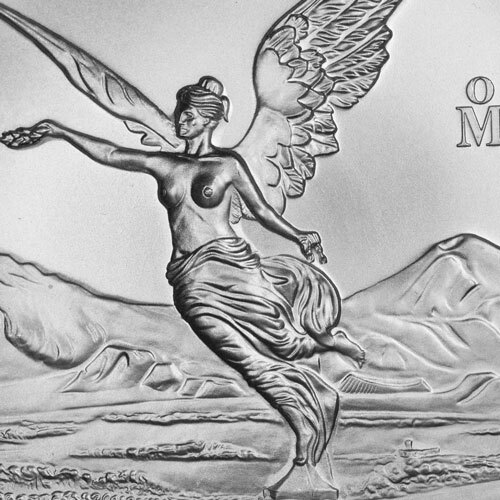 On the obverse of the 2016 5 oz Silver Mexican Libertad is the design of Winged Victory, which depicts the goddess Victoria facing the left. This is a modernized image of Winged Victory that was refined in 2000 for the 21st century Libertads. 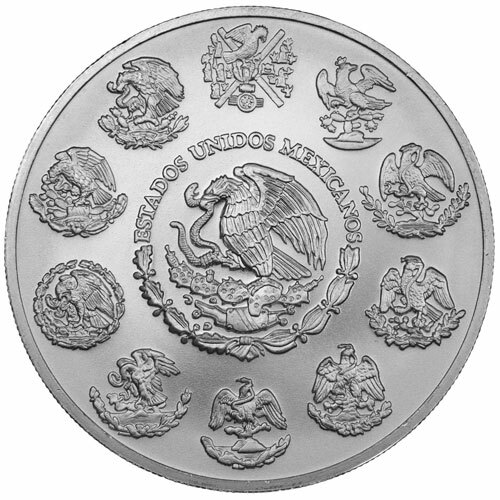 The reverse side of the coins features the coat of arms for Mexico. All coins in the series feature the modern depiction of the symbol in the center, while the 5 oz Silver Mexican Libertad and the other full-weight coins also have 10 historic versions of the design surrounding the modern seal. Founded in 1535 by Spanish conquistadors, the Mexican Mint is the oldest operating mint in the Western Hemisphere. It once produced gold coins for Spanish crown possessions throughout the Western world. Today the facility is the sovereign mint of Mexico and is controlled by Banco de Mexico. If you have any questions, please feel free to contact Silver.com. Our associates are available on the phone at 888-989-7223, online using our live web chat, and via our email address.